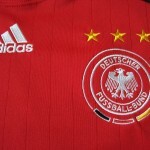 Alles rund um die Nationalmannschaft – in Englisch. Coaches: Jürgen Klinsmann, Joachim Löw. 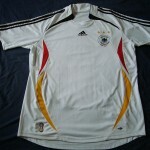 For the World Cup on German soil in 2006 a new kit design was launched in the new Adidas Teamgeist style – resulting in another stylish pair of home and away shirts that provided a simple yet modern, ergonomic look with a number of unique and well thought-out design features incorporating the famous Schwarz-Rot-Gold colours. 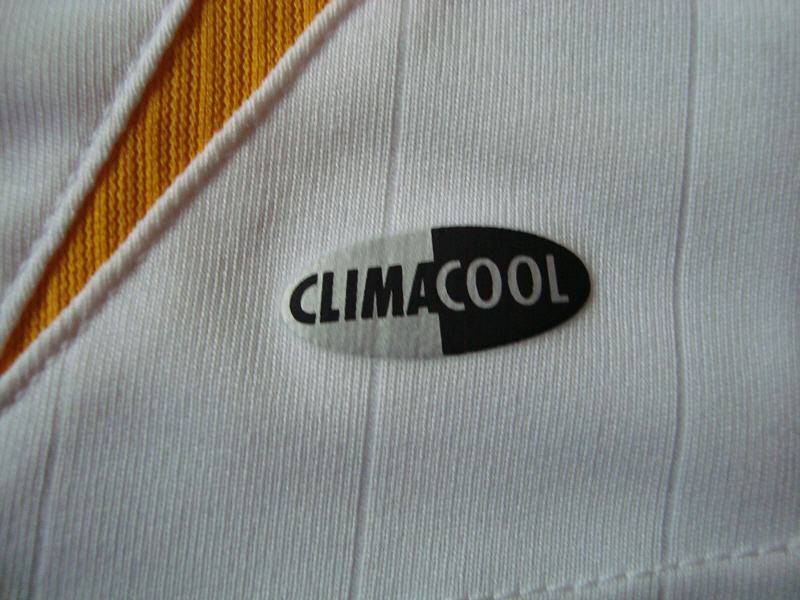 The white home shirt was made from a soft comfortable second-generation “Climacool” fabric that had a curved breathable side panel that extended from the neck out to the shoulders and to the base of the garment. 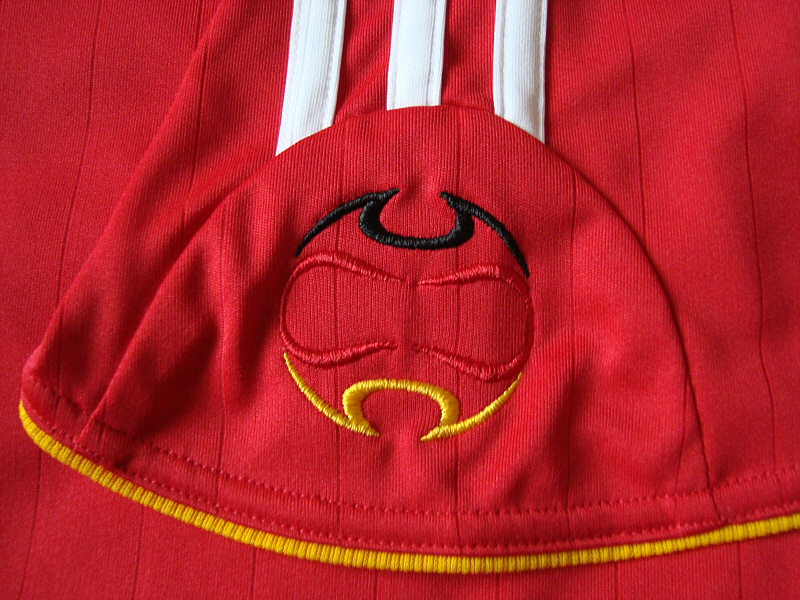 The material had a very fine pinstripe detail, and the side panel incorporated three individual sections in Schwarz-Rot-Gold, with the overall look reflecting the Teamgeist “hourglass” design. 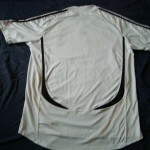 The back of the shirt had a single similar panel in black. 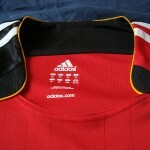 The rounded neck had a scalloped collar with black piping, and the shoulders were adorned by the three trademark Adidas Streifen in black. 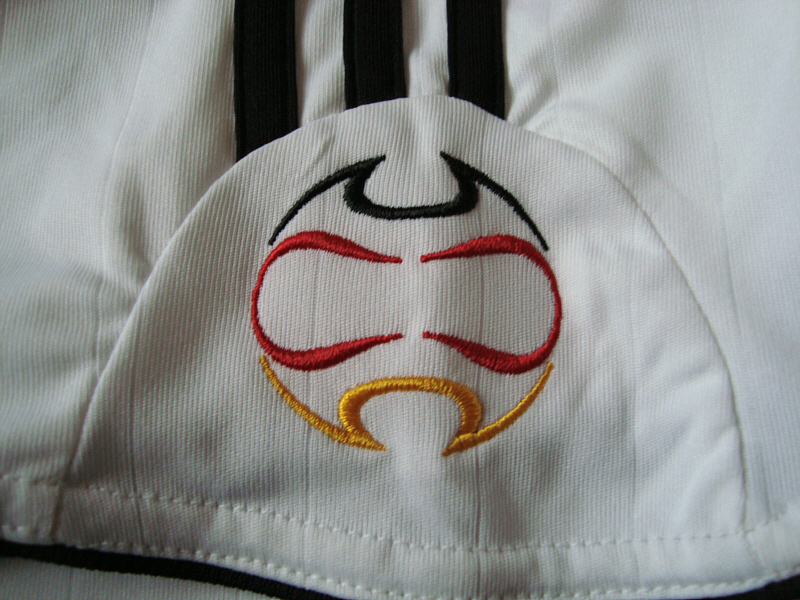 On the wearer’s left sleeve (the right as one looks at the shirt) there was a woven Teamgeist “ball” logo in black, red and gold thread. 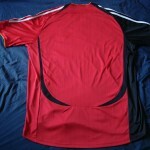 The ends of both sleeves had a thin black piping. 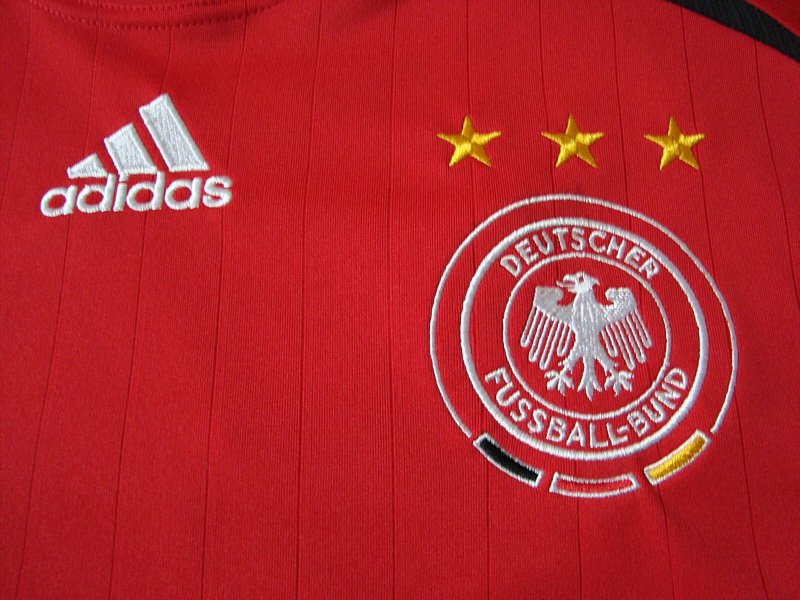 The appearance of the national crest and championship stars were changed slightly from the previous shirt, in that the two inner circles enclosing the eagle and “Deutscher Fussball-Bund” were woven in a grey/silver thread while the eagle itself, the lettering and the outer circle were all woven in black thread – as was the Adidas logo which was now situated immediately below the neck. 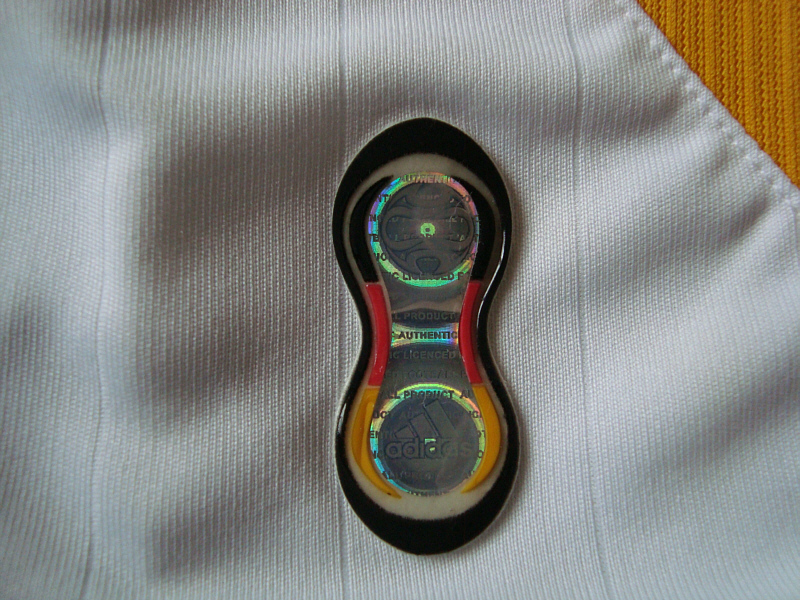 While the three championship stars had been woven in silver on the 2003-2005 shirt, they were now stitched in gold. 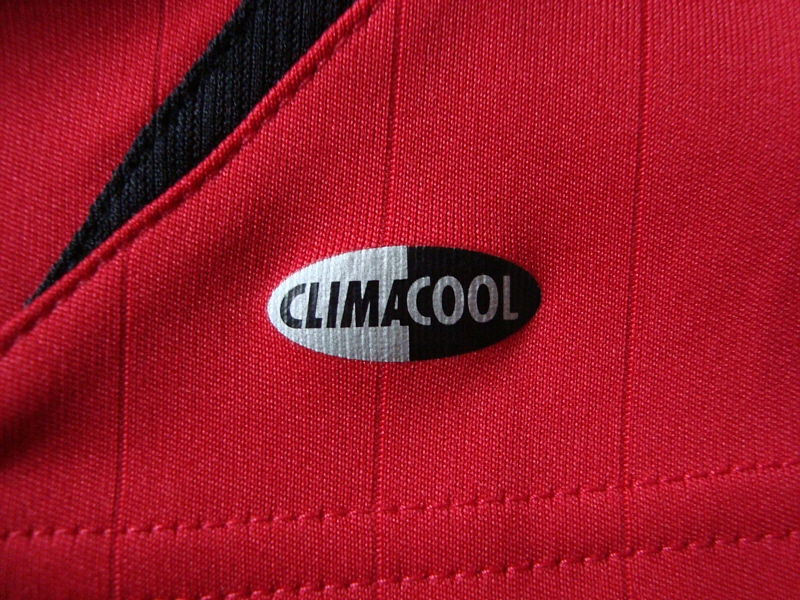 At the bottom of the front of the shirt were the small oval “Climacool” logo on the one side and a small hourglass-shaped Teamgeist “authentic licensed product” hologram on the other. 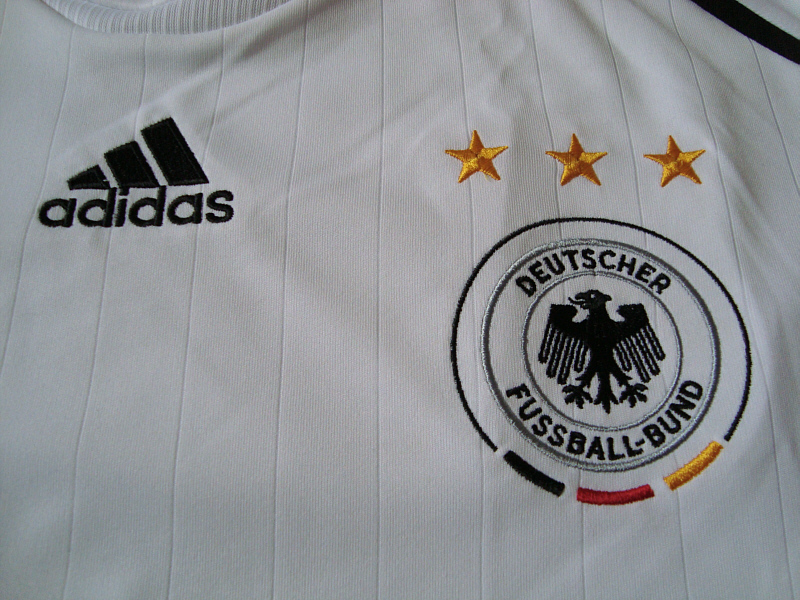 Retaining the traditional Schwarz und Weiß, the white shirt was worn with black shorts, which featured small flashes of yellow and red; the white/silver national eagle and three gold stars were now moved from the left leg to the right with the player’s number being moved to other leg, while the Adidas logo was moved to the back of the left leg. 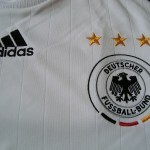 The home Trikot was completed with white socks, which saw the return of the three black horizontal stripes at the top; there was also an Adidas logo in red at the front and “DFB” in black lettering at the back. 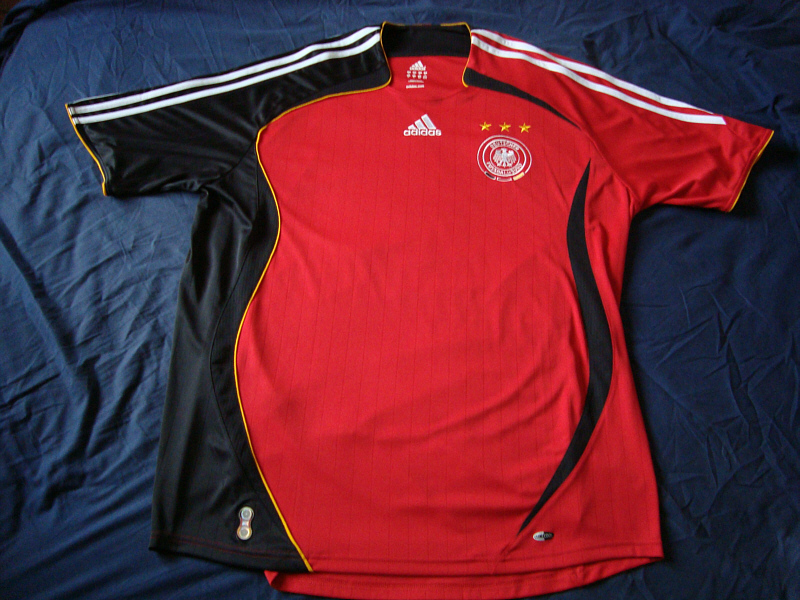 Given the way the tournament went for the Nationalmannschaft there are too many memories with this shirt, both good and bad – though it was clear that German football was back on the up after the doldrums of the Ribbeck era. There were the highs of the opening game the the goal fest against Costa Rica and the dramatic last-gasp win against Poland on the one hand, and the crushing semi-final defeat against Italy on the other – all of which was summarised beautifully in Sönke Wortmann’s film Deutschland. Ein Sommermärchen. Jürgen Klinsmann’s side played all of its fixtures at Germany ’06 in the white home shirt, but the one game I would most associate with it would be the first-round group game against Poland in Dortmund. Having dominated the game for the vast majority of the ninety minutes, the home side had nothing to show for all their efforts – until the very last attack of the game where substitute David Odonkor broke down the right flank and put in a perfect cross for “little bug” Oliver Neuville to slide home. 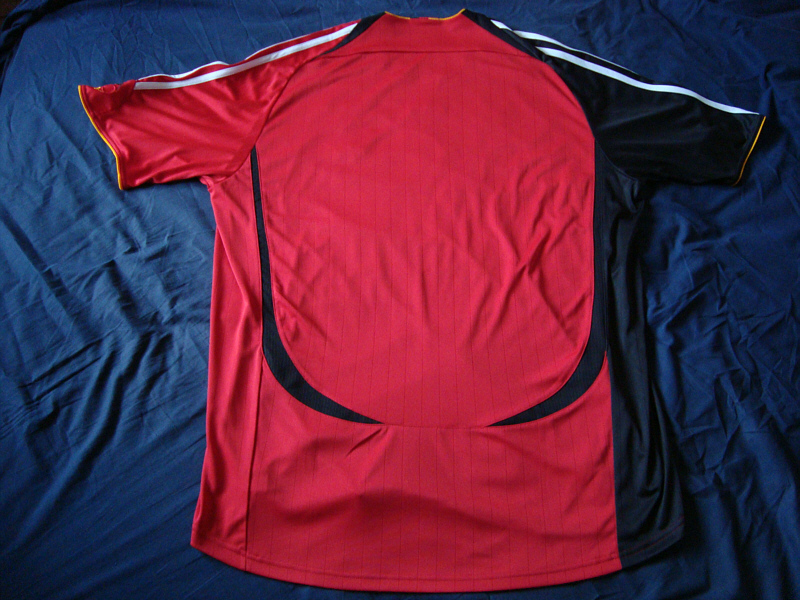 The second shirt had a similar design to the white version, the one major difference being that one sleeve was red and the other black. 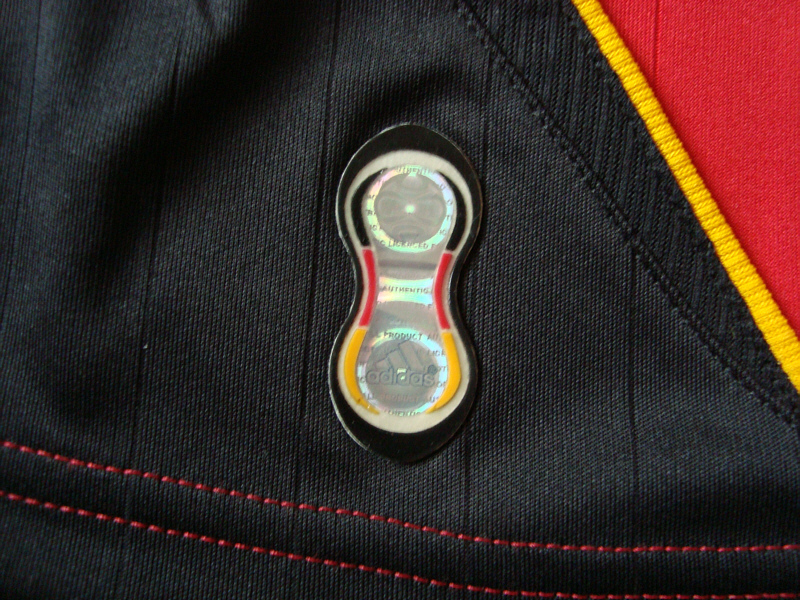 There was the same subtle pinstripe and Teamgeist “hourglass” look, but with the “Climacool” panel only in black as opposed to Schwarz-Rot-Gold. 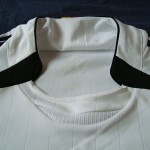 The black section of the shirt extended from the right shoulder of the wearer to the bottom, and covered the right arm and side; it was edged with a fine gold piping, which wrapped all the way around the round-neck collar down to the base of the garment. 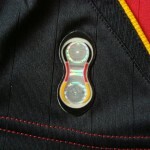 The same gold piping was also applied to the ends of both sleeves. 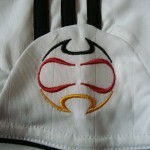 On the right sleeve was the Teamgeist “ball” logo, which was as with the white shirt woven in black, red and gold thread. 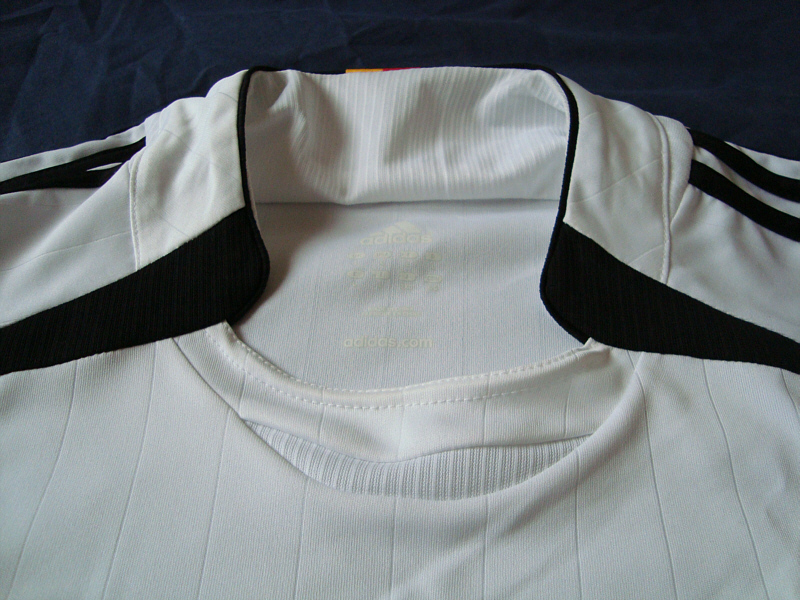 Both the Adidas logo and national eagle were woven in white/silver thread, their positioning being the same as on the home shirt; likewise, the three stars that sat above the eagle roundel were stitched in gold thread. 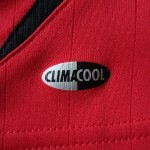 At the bottom of the shirt were the “Climacool” label and Teamgeist hologram. 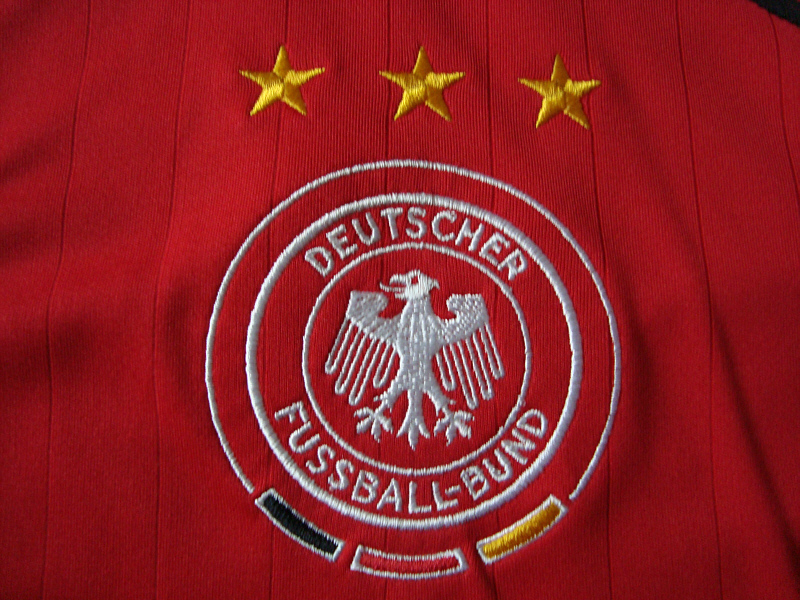 White shorts were worn with the red/black shirt, with the three vertical stripes in black and no other flashes of colour apart from the three gold stars above the national eagle, which was in black on the front of the wearer’s left leg. On the back of the left leg was the Adidas logo in black. 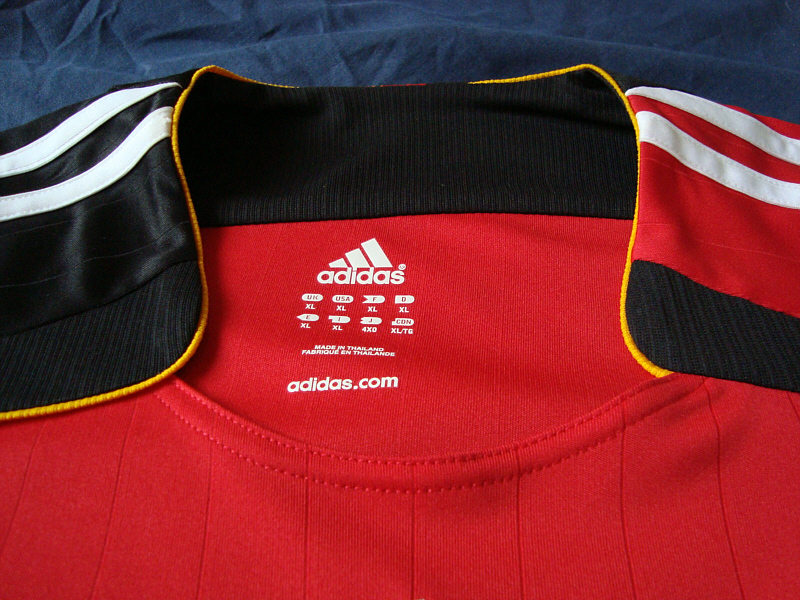 Completing the ensemble were red socks with three black horizontal bands, the Adidas logo in white at the front and “DFB” in gold at the back. 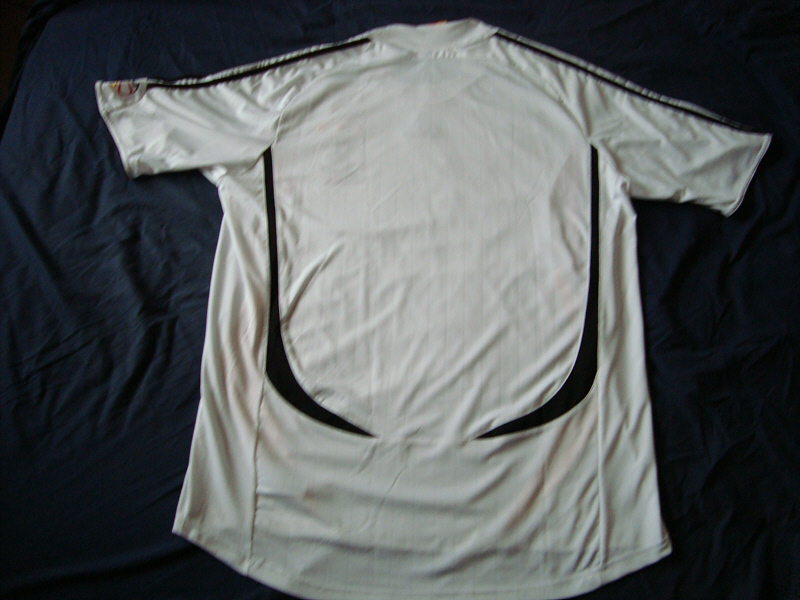 This shirt was worn during a couple of friendly internationals, including the catastrophic 4-1 defeat to Italy – yes, them again – in March 2006 which saw Klinsmann’s head firmly placed on the block. 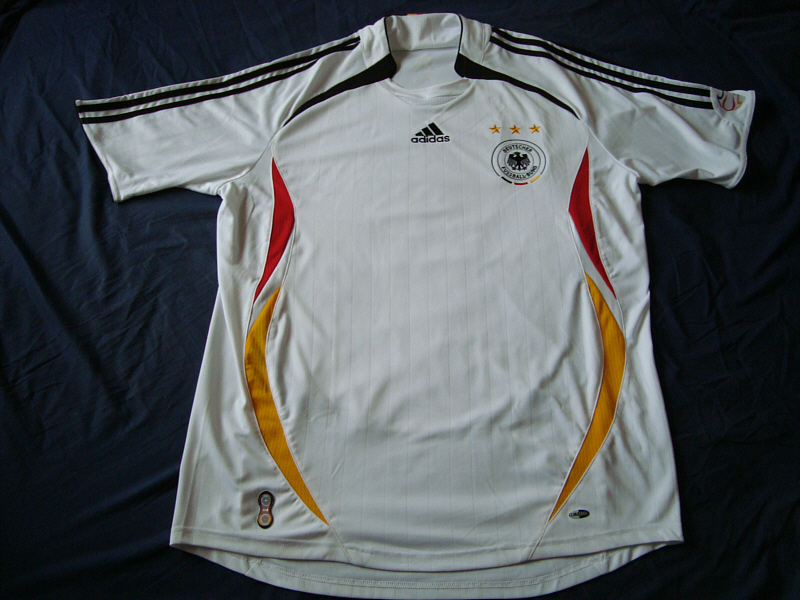 However, I will remember this shirt more for the match against England in 2007 under Klinsmann’s successor Joachim “Jogi” Löw – the first fixture at the new Wembley Stadium. The match was won 2-1, the winner being a stunning strike by Schalke 04 defender Christian Pander – eliciting that amateur wordsmith and comedian Gary Lineker to come up with the highly unoriginal line Pander: eats, shoots and leaves. OK, it did make me laugh. Once. White: v France, 12.11.2005, Paris. Red: v Italy, 01.03.2006, Firenze. What was the cause of the rift between Mesut Özil and the DFB? This site takes time to maintain and money to host, but will never charge for content. All donations are appreciated! Donations will also be used for other projects, including the fantastic Little Bundesliga Book! 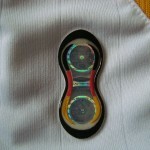 Find out more about the material used on this site here. Basically, information that all bloggers should know. Schwarz und Weiss is looking at moving away from being a one-man show. 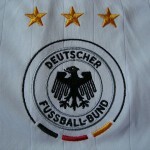 If you are a fan of the Mannschaft and would like to contribute, please contact us. Test knowledge of the Mannschaft by having a have a go at our two quizzes on the World Cup and the Euros. No prizes, just smug satisfaction. 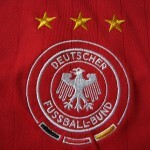 When the Mannschaft are not in action, you can find my domestic club musings on Red Ramblings- the best and most comprehensive blog on Germany's most famous football club, FC Bayern München. 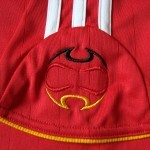 As well as rambling commentary and match reports, you will find opinion, comedy and the occasional culinary reference. Check out my contributions to the excellent Bundesliga Fanatic - where you will find that I write on a lot more than just the Nationalmannschaft. 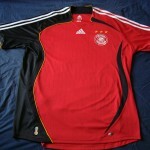 So if you are into an alternative take on FC Bayern's new Auswärtstrikot or obscure East German II. 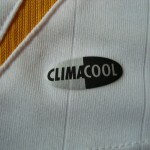 Liga clubs with funny names, go and have a look. You can also find me on FutbolPulse - your trusted source for breaking news & everything related to football, 24/7. From news and features on the German national team to the latest Bundesliga transfer stories and contemporary niche features, I will always have something to say. Copyright © 2019 Schwarz und Weiß. Powered by WordPress. Theme: Spacious by ThemeGrill.